This craft is something that I remember doing with my Mum when I was little. She used to receive a mail order catalogue and when the new one came we could have the old one to cut up. I used to like choosing my favourite items to glue on to a cardboard house. 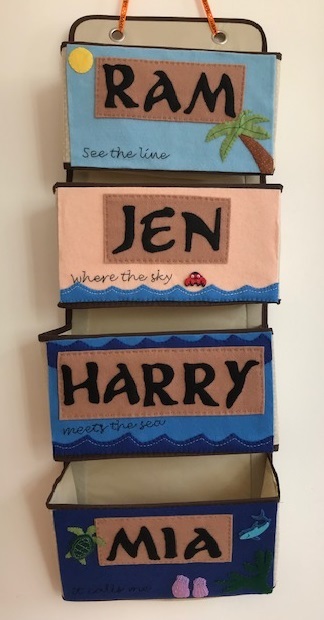 All you need for this craft is a thick catalogue with plenty of pictures of furniture, homeware, toys and other things that appeal to little ones. Ours was a Tesco one, and the Argos one would work well too. I'm working with Harry on his scissor skills at the moment, and he's doing pretty well at it. We went through the catalogue and I got him to cut out pictures of things that he'd like in his bedroom, then we stuck them all down on to some coloured paper to make his dream room. 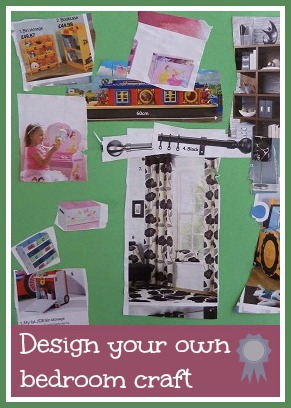 This craft provides a very interesting and often amusing insight into your child's mind. Harry chose a bed with the same bedding that he has at home anyway, but then chose some very pink, girly accessories including a dresser. I was pleased to see that storage was important to him, less pleased to see that he considered a large television essential. He also picked out some smart bookshelves and he really wanted to include a display cabinet, which isn't something that we have in our house. I asked him what he was going to put on display and he said "my stuff". The good thing about this activity was that it kept Mia entertained as well with her own little pot of glue and the off cuts of paper. A really quick, easy and cheap activity - and lots of fun!